A car crash near a major thoroughfare in Santa Clara killed a 15-year-old girl and injured five other people Friday afternoon, a police spokesman said. The teen was a passenger in a white Chevrolet pickup truck heading south on Lafayette Street north of Montague Expressway, where the vehicle crashed into a pole, police Lt. Dan Moreno said. 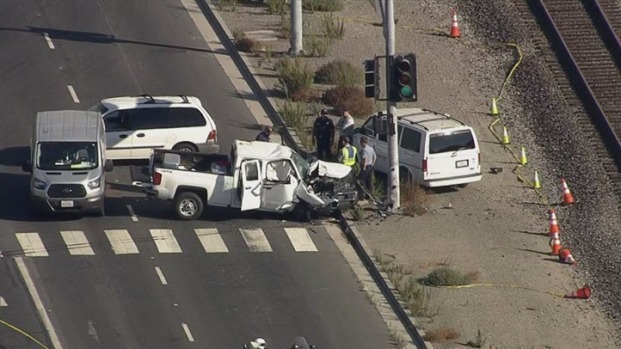 The collision was reported at 3:13 p.m., Moreno said, and responding officers found six people inside the truck. Employees at Taqueria Cazadores, which closed early Friday, told NBC Bay Area that the people in the truck were returning after catering an event in Oakland. The car crashed one block away from the restaurant. Santa Clara woman Mary Kelly said the accident was "awful." Employees said the restaurant owner was driving the truck. Everyone else in the vehicle was an employee or family member, all of whom had helped at the event. It remains unclear who died. "It looked to me like it was really bad," Kelly said. The 15-year-old girl was a passenger and emergency crews pronounced her dead at the scene, Moreno said. The driver and the other passengers were transported to hospitals for varying degrees of injuries that weren't considered life-threatening, according to Moreno. A car crash near a major thoroughfare in Santa Clara killed a 15-year-old girl and injured five other people Friday afternoon, a police spokesman said. Ian Cull reports. Some employees and customers of Taqueria Cazadores went to the hospital to check on their friends Friday. Cindy Jordan was shocked and saddened by the news. "I'm just hoping it's not the girl who I think it is," she said, calling the accident a "real tragedy." The close Santa Clara community prayed for the people who were hurt and killed. "I'm trying to absorb it and believe that happened but I can't. I can't," Jordan said. Witnesses reported the vehicle was driving at the speed limit, then for unknown reasons veered off the road and into a traffic signal, Moreno said. Police are now checking traffic cameras and the truck's own computer system to verify. There were no obvious signs of drugs or alcohol being involved, but investigators are looking into the circumstances surrounding the crash, police said. Southbound Lafayette Street was closed at Agnew Road through the evening commute. It was later reopened. The slain passenger had not been identified as of Friday night. UPDATE: employees at nearby Taqueria Cazadores say the driver and passengers in the deadly Santa Clara crash were employees/family here.